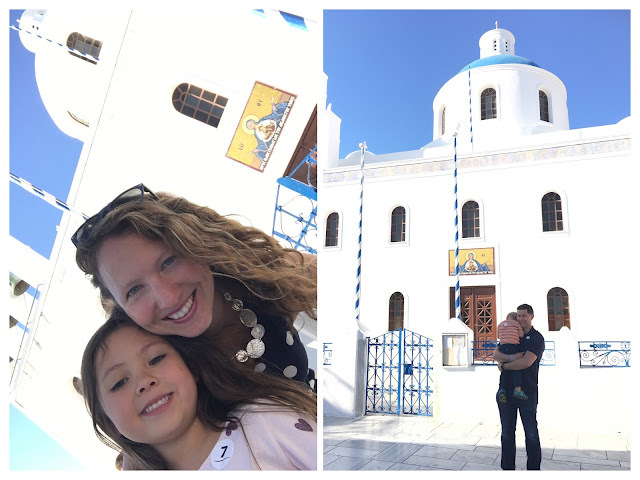 For Eliana's October school break we took a 7 day family cruise on Norwegian Cruise Lines on their Greek Isles cruise from Venice. The itinerary included 5 stops and 2 days at sea. Of the 5 stops, 1 was in Kotor Montenegro, 1 was in Dubrovnik Croatia and the other 3 were in Corfu, Santorini and Mykonos Greece. The cruise boat itself was very comfortable. We booked the family suite so we had plenty of room as it sleeps up to 6 in 3 Queen sized beds. (1 regular bed and 2 pull out beds). Jonathan and I slept in the queen, the children slept in one of the pull out beds together and we left the last pull out bed set up as a couch in the sitting area so that we had a place to always sit. The room had enough space to put all of our luggage away and there was a round table with 4 chairs where we could eat meals in the room when we decided to order room service (which is included in the suite rooms). Room service is nice for when the children are napping or need an early dinner prior to the main dinner. We also ordered breakfast for the room a few times for mornings when the children were awake very early but we didn't feel like getting dressed for public breakfast spaces yet. We had full size floor to ceiling windows along the length of our room so eating in our room was peaceful and offered great ocean views. The suite was located on the same floor as the swimming pool and casual restaurants so it was easy to jump out of bed, grab something to eat and then head to the hot tub or swimming pools. The children's swimming pools were a hit as they were heated and therefore the warmest pools. The big pool in the center of the cruise ship was frigid! Eliana didn't seem to mind as she still frequented the twisty slide in the main pool many times a day. Lucas loved the children's pools and the sports area on the top of the ship. Another great amenity of the cruise ship was the Kids Club. Eliana wanted to go as often as she could. She was hesitant the first day, but after going once we almost couldn't keep her away. We had to insist on family time, otherwise we wouldn't have seen her. Lucas was a couple weeks away from his 3rd birthday and so was not quite old enough for the Kids Club yet. Click here for more photos of cruise boat. Our first stop was in Kotor, Montenegro. We arrived a bit late as the cruise ship departed from Venice several hours late the day before due to heavy fog. 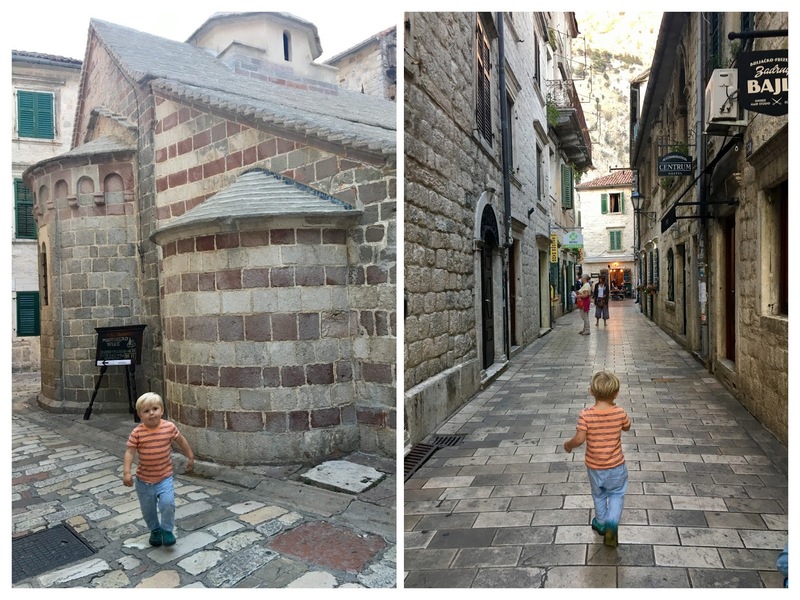 We had about 3 hours in Kotor which was just enough time to get off the ship and explore the old town near the port. We got an ice cream and wandered through its weaving streets. We opted to explore this town on our own without a tour provided through the cruise ship. In Corfu we took the palace and town tour. We decided on this tour as we thought that Eliana would like seeing one of the palaces and because the palace is about a 30-45 bus ride from where the cruise ship is docked it seemed easiest to book directly through Norwegian Cruise Lines. We talked to Eliana prior to our cruise about some of the Greek myths, so she was somewhat familiar with Achilles. Out of the palace tour, seeing this statue was the highlight. We were a little shocked by how poorly the grounds and palace were maintained. It was evident that the palace is lacking funds to maintain it properly. We have been spoiled by how well manicured Switzerland is and compared to Corfu, we were a little disappointed by the upkeep of the palace and underwhelmed on the views looking over the grounds and into the Sea. If we did this cruise again, I think we would opt out of this tour. Instead, we would find transportation from the cruise boat terminal to the old town of Corfu as it is about a 20 minute drive from the cruise port. The old town itself had wide pedestrian only promenades and was filled with restaurants. We took advantage of some down time during the old town tour to find a local restaurant where we ordered traditional Greek food. The food was the best part of our time in Corfu. 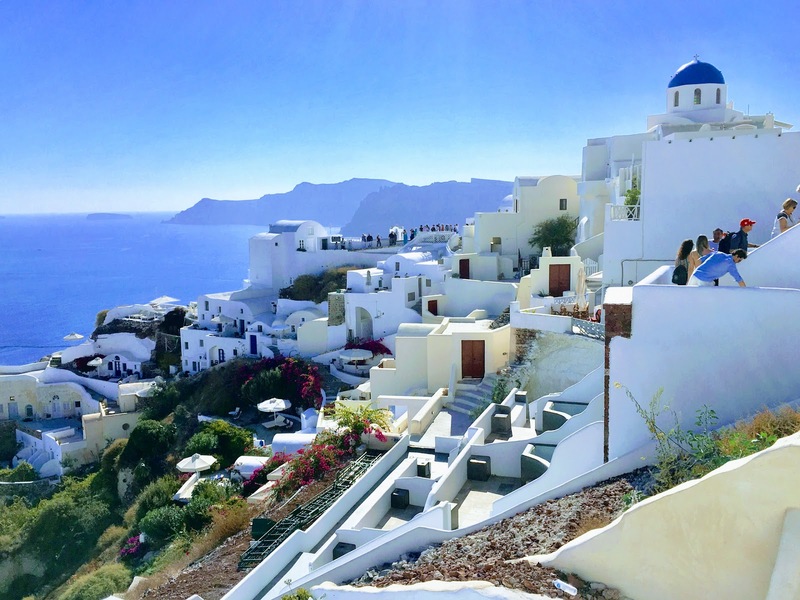 We would recommend getting to this part of town just for a little walk off the cruise ship and for some authentic Greek food. Wandering on the large promenade (main pedestrian street) in Corfu. Attempting a selfie in the bright sunlight. Happy I had sunglasses. One of our views of Santorini in the small village of Oia. The whitewashed stone buildings that are built right on the edge of the hillside next to the Sea are magnificent. I wish we would have had more time here as there were several small boutiques. Specifically, there were many handmade jewelry boutiques. We did find some very cute wool and leather slippers for Eliana in Oia. Church located in the main square of Oia. Views of homes built into the cliffside were just opposite this church. Just opposite the church in the main square in Oia. Remember to pack sunglasses! From Oia, the tour took us to one of castles (or remains of a castle). We walked up several steps to the top of a hill where we roamed the castle grounds. On our way up we found many touristy shops selling knick knacks. We purchased 2 placemats with scenes from Santorini to add to our collection of other places we have visited. From the top of the castle grounds overlooking the town and hillside below. After the castle, we went to a restaurant where Greek music and dancing took place. The highlight was that the children got to throw a plate, yell "Opa!" and then dance on the broken plates. 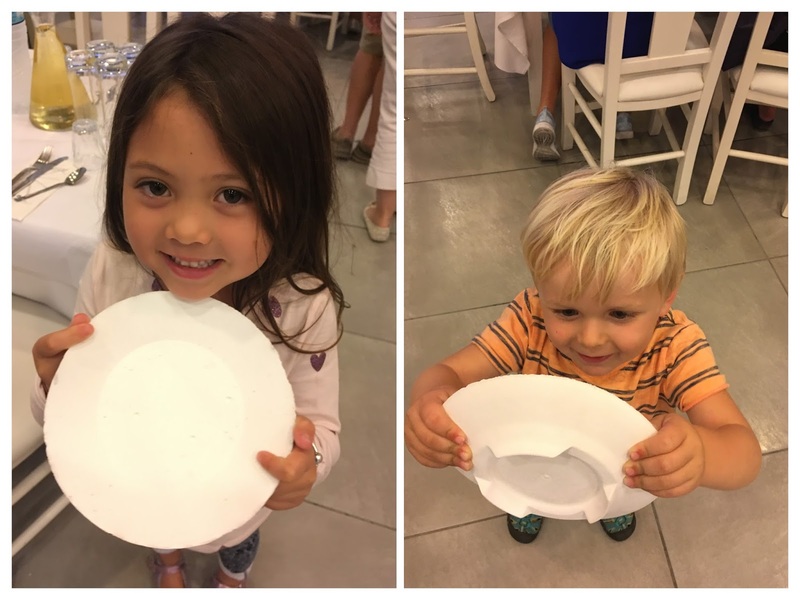 The children loved being allowed to throw a plate and then dance on the broken pieces. The food was mediocre at best... The experience was fun, but I wouldn't recommend it - especially if you don't have children. Mykonos was an unexpected gem. I loved it. Maybe it was because after 3 days in a row docking and getting off the boat we had considered not going into Mykonos and just enjoying a quiet day on the boat. 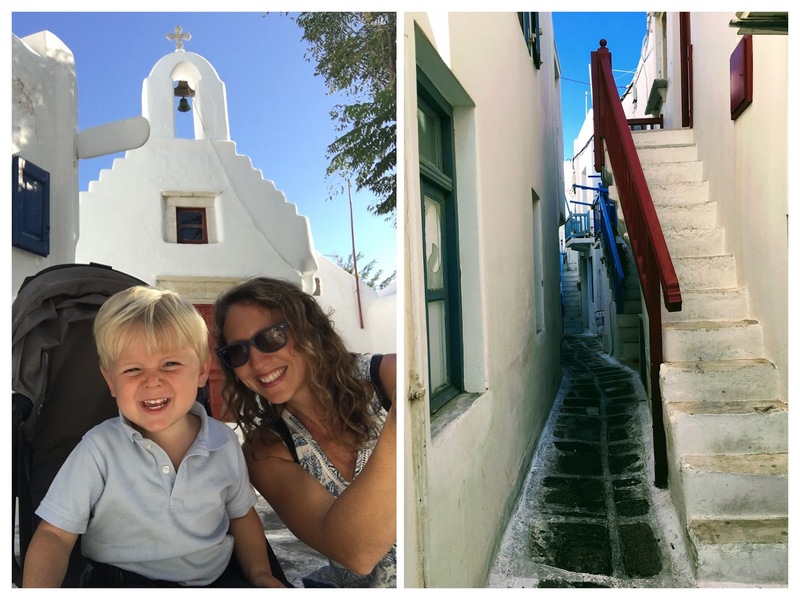 In the end, Jonathan and Eliana stayed on the boat to relax and I took Lucas into Mykonos for a couple hours by myself. It was beautiful! 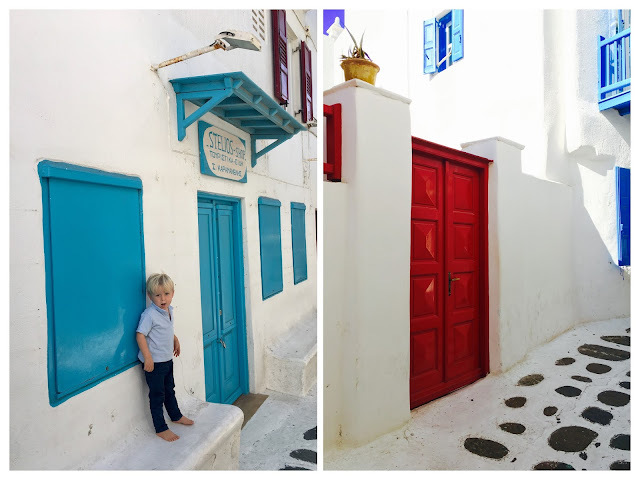 We forgot Lucas' shoes this day, so Lucas wandered through the streets barefoot while knocking on all the doors and climbing on architectural components of the buildings. We eventually made our way back to the cruise boat ferry, but enjoyed every minute of the journey. In Dubrovnik we decided to tour on our own and not take an official cruise tour. We got off the boat and took a bus into the old part of town. Once in the old town we wandered through the quiet streets (it was only quiet for the first couple hours - go in the morning!). The old town is like a town itself inside another town. You enter the town walls and are surrounded by beautiful architectural buildings and small winding back stone alleys. We left the old town walls on the water side and found a local who was offering scenic boat tours of the water surrounding Dubrovnik. Looking back at our cruise I would have to say that our 3 favorite ports were Santorini, Mykonos and Dubrovnik. It was a great way to see many places in a week's time. The children loved the boat itself due to all of the activities on board (not to mention the endless supply of self-serve ice cream). Jonathan and I liked the ease of traveling between cities and being able to stay in the same "hotel" room every night. With young children there is something about staying the same bed every night while on vacation and not having to pack/unpack every couple days. It was our first family cruise and we have already talked about doing another one in a different destination.